The performance was premiered on March 20th, 2004 at the Sanjie Liu Sing Fair, one mile from West Street (Xi Jie). 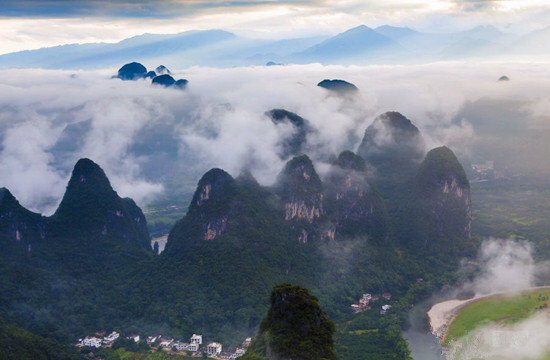 This is the world largest natural theater which utilizes the waters of the Li River as its stage, with twelve mist shrouded hills and the heavens as its backdrop. Mist, rain, moonlight, the hills and their inverted reflections in the river all become the ever-changing natural background. Its auditorium is housed on the natural islands of the river with the audience standing on the designed terraces, surrounded by green plants. The sound equipment here cannot be seen because it is in harmony with the natural environment. The valleys, the hills, the cool breeze and the gurgling streams are all elements contributing to the three-dimensional sound effect. Day by day, different weather offers different scenery with the four seasons refreshing the performance as well, so you will have unique experience every time you watch it. This is really a new concept opera using nature as an integral part of its performers; hence its name – ‘Human’s Masterpiece Cooperated with the God’. Maybe you have heard of the film ‘Sanjie Liu’ produced in 1961, which made the Li River famous worldwide. Sanjie Liu is a fairy singer in the myths and legends of the Zhuang ethnic minority. She is incomparably beautiful, and has voice to match her beauty. 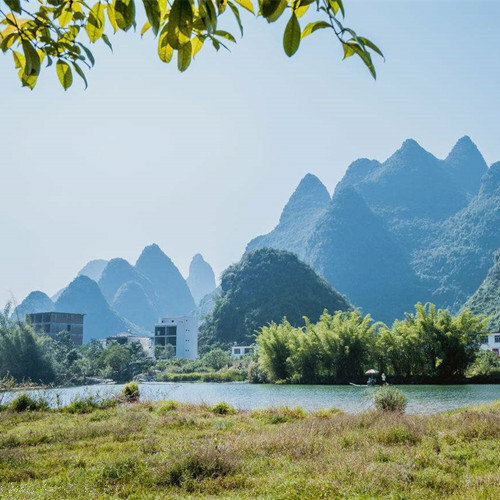 In the ‘Impression on Sanjie Liu’, what you can see are the impressions derived from the daily life of the people living around the Li River, rather than the specific details of the stories. 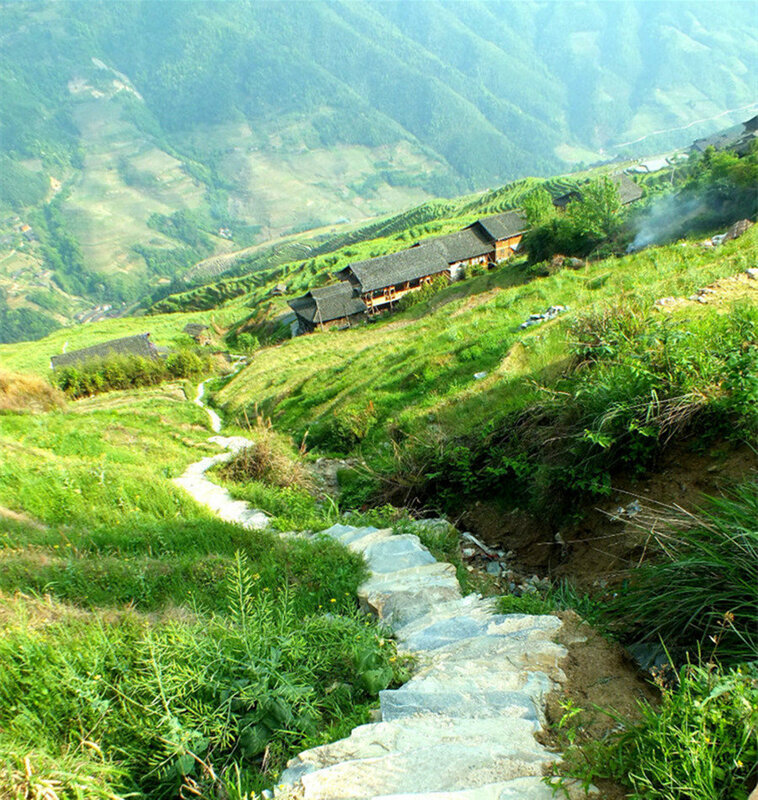 From these impressions, you will gain a realistic impression on the background of Sanjie’s birthplace and understand the beauty of the folk songs’ hometown. The performance is divided into seven chapters including the preface and epilogue. At the beginning, the lights are all turned off and the image of Sanjie appears indistinctly in the sky with beautiful songs ‘Sing the folk songs, here I am singing and there you are echoing…’. As the lights come up, the twelve hills appear in front of the audients; and a small fishing boat is rowed from the hills. This is the Preface – the Legend of Hills and Rivers. The first chapter is the Red Impression: Folk Songs. On the water, many fishermen are rowing their bamboo rafts in a column. Either standing or squatting, they hang the large red silk in the sky and or upon the water. This red picture symbolizes the enthusiasm and praises the labors of the local people. The second chapter is the Green Impression: Garden. The color green symbolizes nature as well as the vitality. Among the green hills and rivers, the smoke from cooking fires curls upward; herders are heading home with their cattle under the gleam of the sunset. The women, washing clothes beside the water are waiting for their husbands who are rowing the fishing rafts back home. This chapter reveals the peaceful and happy life of the local people. The third chapter is the Golden Impression: Fishing Lights. Hundreds of bamboo rafts with golden fishing lights are spreading all over the river. 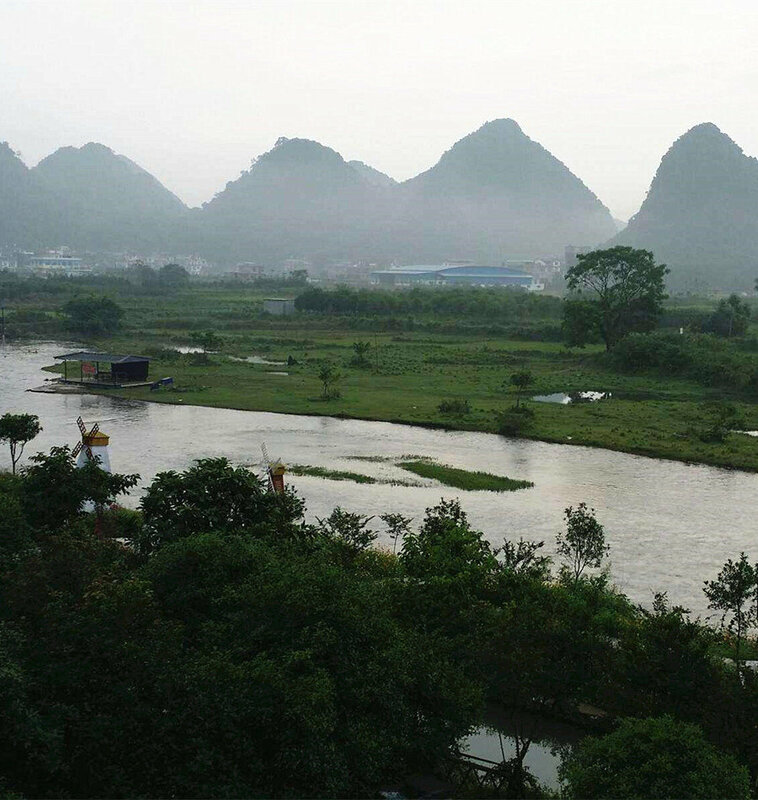 The rafts, gently rocking make the golden fishing lights dance upon the waters, the straw rain capes, the frolic cormorants and the hills construct a perfect picture describing the simple existence of the people around the Li River. The fourth chapter is the Blue Impression: Love Songs. Under the deep blue sky, and on the dark blue water, the performer of Sanjie is singing classical love songs. Then, a crescent-shaped boat with a charming fairy dancing in is flying onto the surface of the water. A group of pretty and young girls, dressed in red or white are bathing around the boat. In this blue world, these beautiful girls seem to become the notes of Sanjie’s love songs. The last chapter is the Silvery Impression: Performance Grand Ceremony. As the ‘Wonder of Lijiang Culture’, this scenery reflects the traditional ceremony in Sanjie’s hometown according to the legend. Over 200 Zhuang girls form a long column across the bridge over the Li River. Their silver dresses make the river shimmer in a mysterious manner. In the Epilogue, the fishing rafts are rowed farther and farther from the audience while the beautiful songs of Sanjie are still echoing among the hills. The girls on the bridge present their thanks for the audience with their affectionate folk songs. Except for the perfect seven pictures, the performance also boasts both modern and classical music played by famous musicians of China. 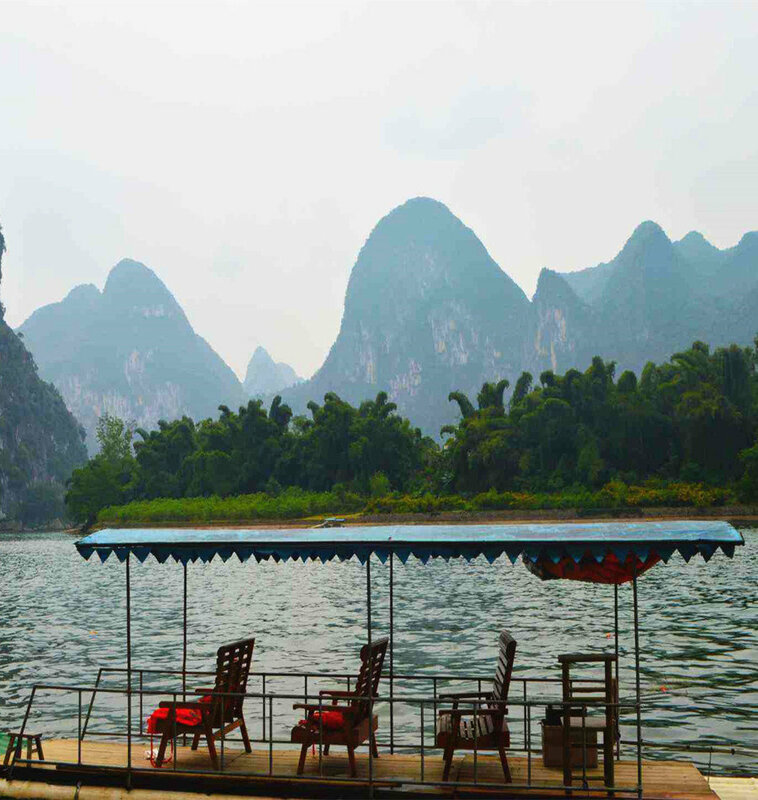 Additionally, there are in excess of 600 performers, all of whom are local people of the Li River. 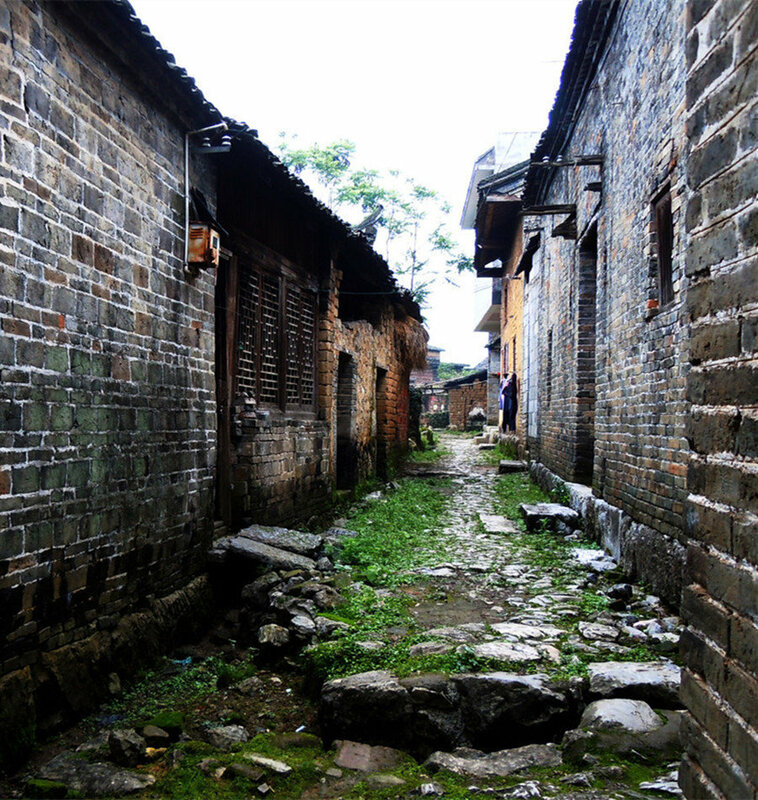 They present the reality of life for the people in Sanjie’s hometown through their primitive and wonderful performances.